How many times have you wanted to use a TV as a computer monitor? Maybe there has been a situation where you wanted to extend the output of your laptop or portable computer onto a TV screen but the computer did not have a TV output? While the TV-out was a standard port on older laptop computers, it is seldom found on modern portable and ultraportable computers. This is where a device like the Grandtec GEZ-1000 VGA-to-TV converter comes in. 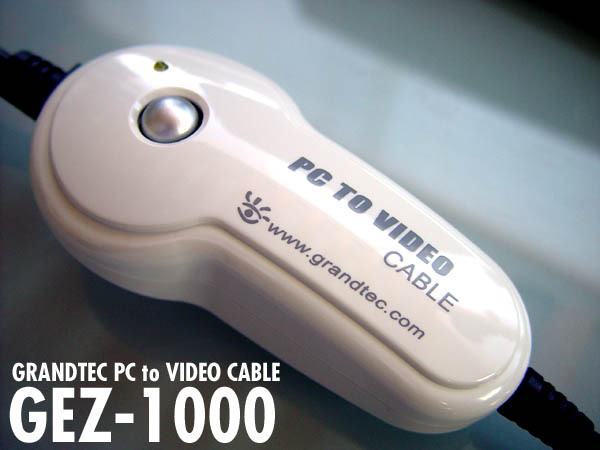 About the size of a standard pencil eraser (4” x 2.25” x 1.25”), the GEZ-1000 takes a VGA signal and converts into a TV signal via a standard composite video RCA or S-Video cable. The GEZ-1000 uses a starndard USB port to draw its power, so no external power source is required. Simply plug it into the VGA source, and composite video or S-Video output, and any available USB port, and the device will automatically begin relaying the VGA image to the TV it is connected to. If you are considering this converter, make sure to have long enough VGA and video cables available, as these are not included in the package.